Dr. Hedlund grew up in O'Neill, NE and graduated from O'Neill High. He attended the University of Nebraska at Lincoln where he played football and earned his Chiropractic Degree from Northwestern Health Sciences University in Bloomington, MN. 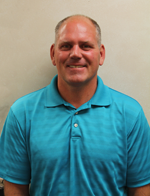 He joined Elkhorn Valley Family Medicine in 2007. Dr. Hedlund's special interests in medicine include: back pain, neck pain, chronic soft tissue injuries, and kids and child care. He enjoys spending time with his family outdoors as well as hunting and fishing.